Buried under the weight of a 25-point deficit late in Sunday’s first half, 10th-seeded Iowa could have easily given up hope. The Hawkeyes instead kept scratching and clawing their way to daylight, nearly pulling off a record-setting comeback. Iowa almost became the second team in NCAA tournament history to rally from a 25-point deficit, but the Hawkeyes couldn’t finish the job in overtime. Grant Williams scored six of his 19 points in the extra period, helping second-seeded Tennessee escape with a 83-77 victory and advance to the Sweet 16 for the first time since 2014. Had Iowa won in overtime, it would have made history. Never before had a team rallied from a 21-point halftime deficit to win an NCAA tournament game. Only 2011-12 BYU had ever erased a 25-point deficit in an NCAA tournament game, a feat the Cougars pulled off at Iona’s expense in a First Four matchup. In some ways, Iowa’s near-miss against a team once ranked No. 1 in the nation is a massive achievement. The Hawkeyes were left for dead just a week ago when they entered the NCAA tournament having dropped six of their past eight games including a terrible home loss to Rutgers. In other ways, coming so close and falling short has to be especially frustrating because Iowa was trying to end a 20-year drought without a single appearance in the Sweet 16. 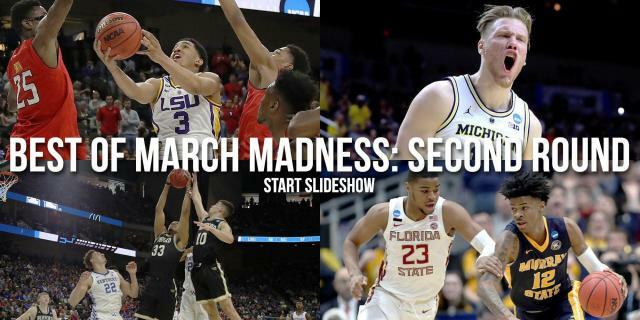 The Hawkeyes had been in the round of 32 twice before under Fran McCaffery, and they endured a pair of humbling blowout losses to Gonzaga and Villanova. For awhile, Sunday’s game appeared headed down a similar path until Iowa began to show life and Tennessee began to get careless. The Hawkeyes made a concerted effort to get Tyler Cook the ball in the post to open the second half and he delivered, scoring 11 of his team’s first 16 second-half points to transform a rout into a nine-point game. Tennessee aided Iowa’s comeback effort with needless fouls, inconsistent effort and sloppy turnovers. Especially costly was Admiral Schofield picking up his third foul with 16 minutes remaining, forcing the Vols to play without one of their stars and emotional leaders for long stretches of the second half. Iowa forged its first tie under controversial circumstances when referees mistakenly whistled Lamonte Turner for a foul even though he seemed to cleanly block Jordan Bohannon’s 3-point shot. Bohannon sank all three foul shots, tying the score at 67 with less than three minutes to play. Undaunted, Turner answered with maybe the biggest shot of regulation, a corner 3-pointer that restored Tennessee’s advantage. The Vols actually led by four in the final minute, but Iowa came back to force overtime on an Isaiah Moss transition layup and a pair of Joe Wieskamp foul shots. In a very strange twist, Tennessee secured the victory in overtime without Schofield coming off the bench. The Vols’ second-leading scorer said after the game that he told Rick Barnes to keep playing Kyle Alexander instead of him, a move that was likely intended to bolster Tennessee’s rebounding and defense. 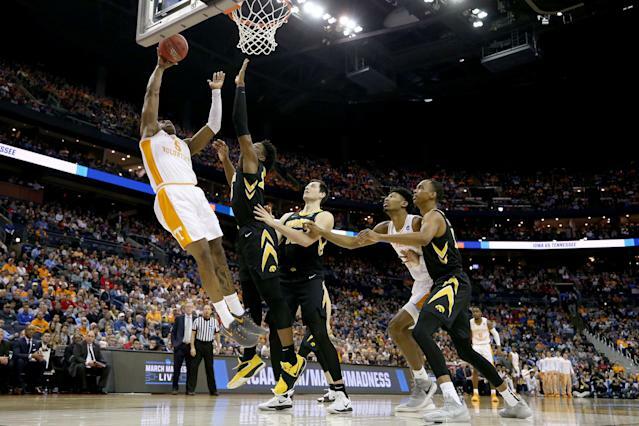 For Tennessee, avoiding a historic meltdown also meant staving off a second straight early NCAA tournament exit. Last year, the Vols lost at the buzzer in the second round to eventual Final Four team Loyola-Chicago. Tennessee has greater ambitions this year after the Vols contended for the SEC title and spent the entire season ranked in the top 10. They’ll face third-seeded Purdue next week with a berth in the program’s second-ever Elite Eight at stake.